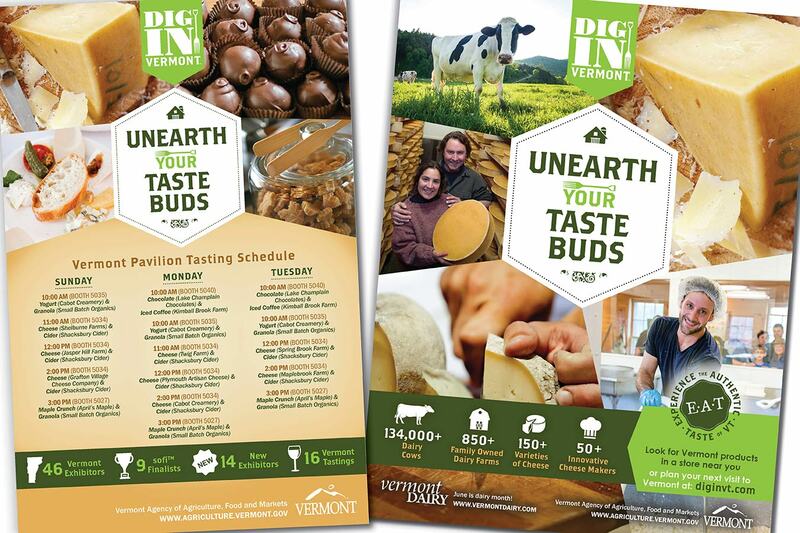 Capitalizing on the brand equity in the Dig In Vermont "Unearth Your Taste Buds" campaign, the CMO has worked with the Agency of Agriculture to promote Vermont and VT products in NYC-based 'foodie' print publications. We support outreach and marketing activities within individual state agencies and departments by providing strategic planning and tactical support. We can provide some ‘in-house’ graphic design services, and we can also refer agencies or departments to pre-qualified marketing vendors and master contractors for additional marketing and creative services. Also in statute, Bulletin 3.5 (the guiding document to state contracting policies and procedures, issued by the Agency of Administration in 2008 and revised in 2018) requires that the Chief Marketing Officer approve all contracts for marketing services over $25,000. The State of Vermont Marketing Group is a networking opportunity facilitated by the Chief Marketing Office, and open to any marketing and communications staff within state government. At these meetings, we share best practices, discuss current projects and challenges, and explore opportunities for collaboration. This group is not generally open to external partners (ad agencies, marketing firms, etc. ), although we do occasionally invite outside partners in as guest-speakers on topics of interest. If you would like to join the ‘SOV Marketing Group,’ please email marketing@vermont.gov and include a brief description of your outreach and communications responsibilities. Heather Pelham joined the Chief Marketing Office in April 2013 and was appointed Chief Marketing Officer in June 2015. Prior to joining state government, Pelham was the managing partner of a central Vermont advertising and design firm, developing brand strategies and integrated marketing campaigns for small business, nonprofit and higher education clients. Also an accomplished designer, Pelham has 20 years of experience in creative strategy, graphic design, and web development. Pelham is a graduate of Brown University and lives with her family in Randolph Center. Erin Robinson joined the Chief Marketing Office as Marketing Manager in October 2015. Erin graduated from Champlain College in May 2008 with a Bachelor’s of Science in Multimedia & Graphic Design. Her experience includes working as a Marketing Specialist at a consulting engineering firm, and prior to that as a freelance graphic design intern for the Champlain College Marketing Department and as an intern for Place Creative Company. She is a lifelong Vermonter and resides with her family in Calais.